Meet Munson, The Master’s Lawn Care’s mascot! As a puppy, Munson was rescued from a Georgia fan at the 2010 Florida/Georgia game in Jacksonville. Luckily for him, he has been shown the light and is now a true Florida Gator fan! 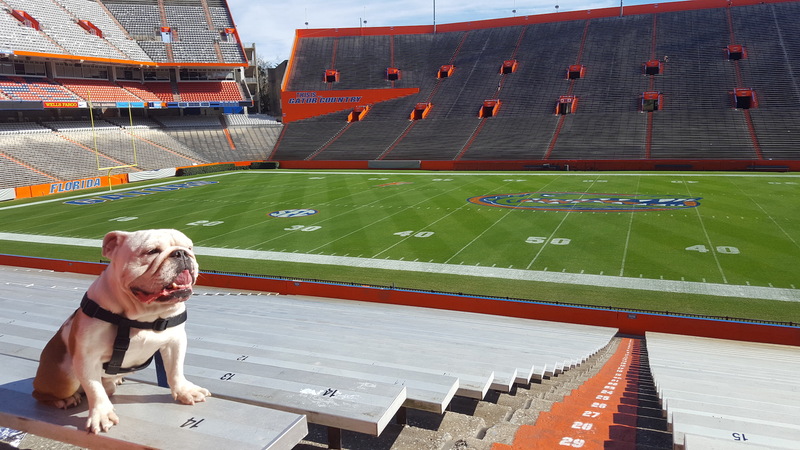 He has even been to the Swamp and loved every minute of it! Munson and his buddy, Gator, typically ride around with TMLC owner Rusty Thompson on weekends. Riding in the truck is the highlight of their day. When they're on good behavior, they get to accompany Rusty to the office and "help" work. At the Master's Lawn Care, we are animal lovers. That's why all of our lawn programs; fertilization, insect control, flea/tick yard control, and weed control are organic-based and child/pet-friendly. We will never plant or apply anything in your lawn that is hazardous to you or your pets.